Grout Cleaning: Professionally Cleaned or DIY? DIY or professional grout cleaning? Lots of home projects are worth tackling on your own, especially if you enjoy the work itself and the sense of accomplishment when it is done. But, some people would prefer to just hire the professionals and do other things with their time. Let’s weigh the pros and cons of cleaning your tile grout yourself versus hiring someone else. 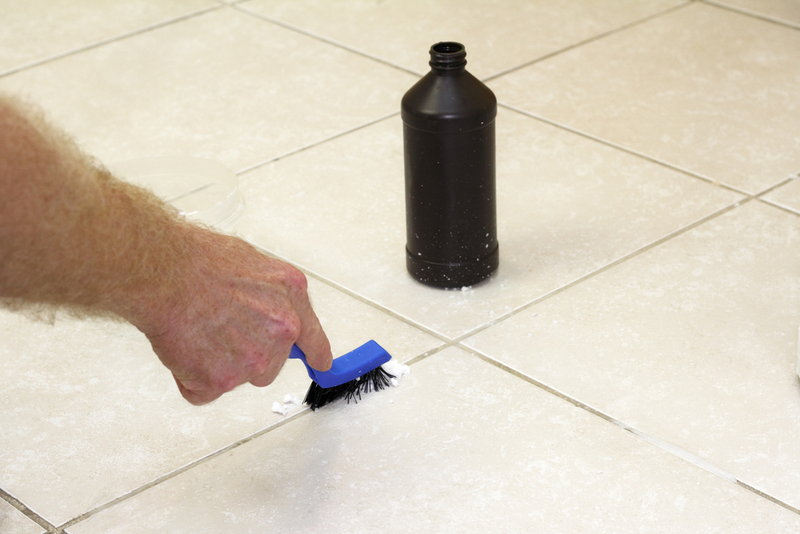 Tile and grout cleaning involves using a special cleaning solution and lots of scrubbing. If you don’t want to spend the day crawling around on your knees, you can get a grout brush with a long handle so you can stand and scrub. Quicker work can be done by renting a tile and grout cleaning machine from your local home improvement store. Or, a simple Google search will show multiple grout cleaning services in your area to call. They use their own cleaning products and large machines (sometimes mounted in a truck that sits in your driveway with very long hoses that extend into your house). DIY grout cleaning can be done with special grout cleaning solution, again found at any grocery or home improvement store. A “green” alternative is to make your own paste out of oxygen bleach. Oxygen bleach is non-toxic and won’t irritate your eyes or throat as you clean. It also won’t ruin any surrounding baseboards or discolor your tile. The paste can be made by mixing powdered oxygen bleach with warm water (see the product’s label for dilution quantities as they can vary depending on the quality of bleach you get). Pour the solution onto dry grout, completely soaking the grout lines and let it sit for up to 60 minutes, then scrub vigorously. This one obviously depends on the amount of grout and the amount of dirt. Only you can determine that, but plan for about one to two hours per 100 square feet. A professional cleaning company can complete your entire house in about two to three hours. The pros charge anywhere from $0.75 – 1.25 per square foot. You can also add a sealant for another $0.50 per square foot, but prices may vary. Buying grout cleaner yourself can cost less than $10 per 32 ounce bottle or up to $50 per gallon, depending on which product you choose. Another factor to consider is how you value your time – is it $50 per hour or $200 or more? Think about that when considering if hiring someone would be more or less expensive than doing it yourself.